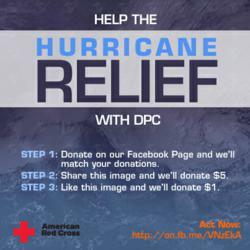 By encouraging Likes, shares and donations through it's brand Facebook Page, DPC helps spread the word and raise funds for hurricane victims with a month-long campaign. With the support of Facebook users across the country, New Hampshire IT staffing firm Digital Prospectors has helped raise $5,000 for Hurricane Sandy victims and victims of future disasters. The funds will be donated through the American Red Cross NH Chapter. DPC raised the money by using its Facebook brand Page in a few different ways. The IT staffing firm integrated an application into its Page where fans could donate online and then matched all donations made through the application. To further raise awareness for the cause, DPC also created images promoting the cause and pledged to donate $1 for every Like of the images and $5 each time a Facebook user shared an image on their own wall. The campaign ended in December and resulted in more than 500 actions taken on Facebook in less than a month. All proceeds benefit the American Red Cross Disaster Relief Fund to assist Hurricane Sandy victims. Catino said her company anticipates running similar social media efforts for fundraising in the future to supplement its existing support of non-profits such as Families First and Families in Transition. With clients in industries such as aerospace, defense, healthcare and more, DPC has become known for its success in recruiting and placing engineers and IT professionals in the software, firmware, hardware, mechanical and electrical engineering markets. DPC’s primary technical focus areas are in embedded systems engineering, health information systems, and web services/cloud computing. Since DPC’s founding in 1999, the firm has been recognized as a "Best Company To Work For" by Business NH magazine, a "Top IT Services Company" by Inc. Magazine, a "Most Reliable Staffing Agency" in Forbes Magazine, a "Top Ranked Staffing Firm" and "Fastest Growing Staffing Firm" by Staffing Industry Analysts.